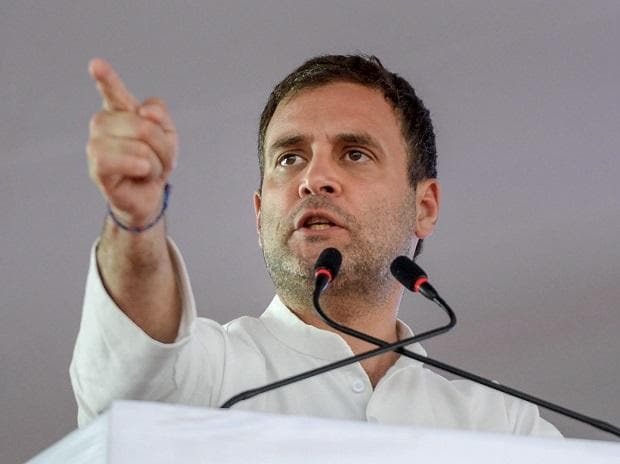 Congress president Rahul Gandhi Saturday said the 2019 Lok Sabha election is a fight between Anil Ambani and ordinary people, thieves and honest people and false promises and the truth. "This election is between Anil Ambani and the common citizens, five years of 'Anyay' (injustice) and NYAY (justice/minimum income scheme), thieves and honest people and false promises and truth," said Gandhi at a public rally here. He added that the fight is also about the "lie" of Prime Minister Narendra Modi of depositing Rs 15 lakh into everyone's account and Rs 3.6 lakh into the accounts of women living below the poverty line as promised by the Congress. Mocking the 'Chowkidar' (watchman) term coined by the prime minister for himself, Gandhi sought to know whom did the watchman guard. This Chowkidar guarded 15 to 20 rich people," he said. "The prime minister had promised to give Rs 15 lakh into everyone's account but the murder accused Amit Shah called it a Jumla, which he said was spelt just like that," said Gandhi.